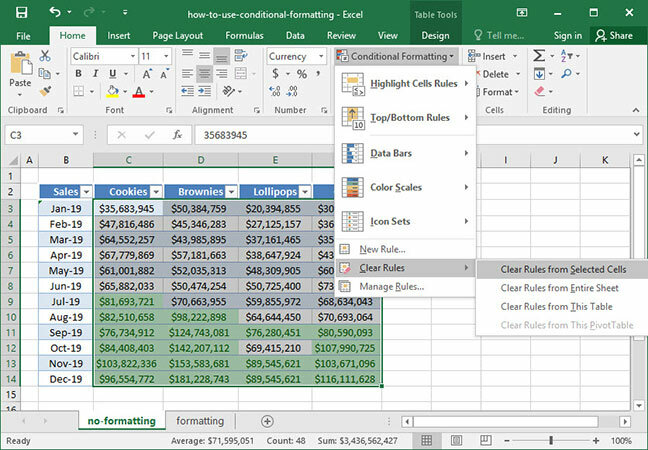 Conditional formatting is a feature of Microsoft Excel that allows you to apply formatting that changes depending on the value of a cell. 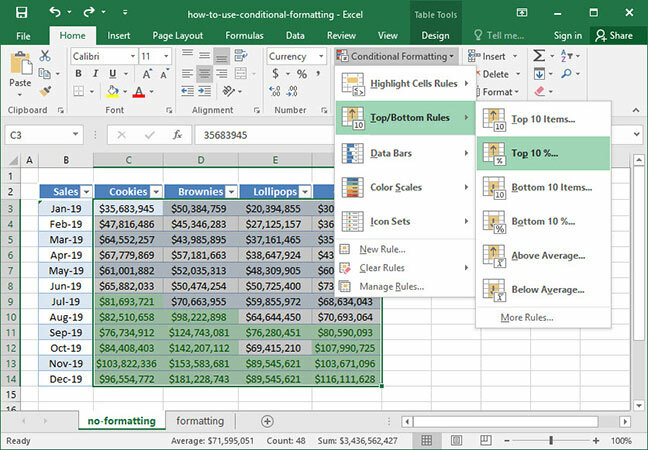 For example, you can set a rule that highlights numbers in red if they are below a specific threshold; or, a rule that colors high numbers green and low numbers red. 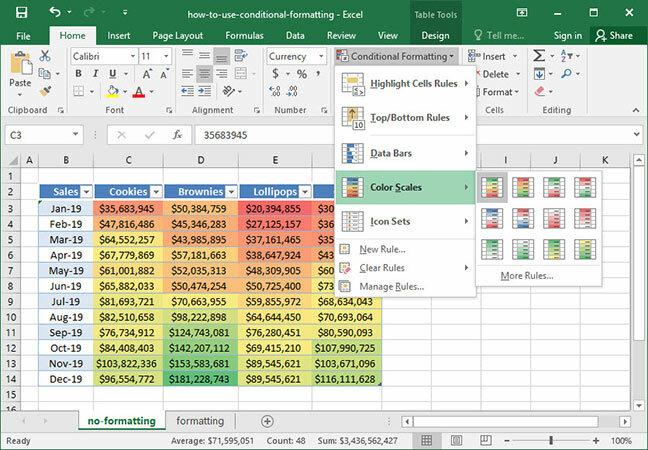 Conditional formatting is an advanced technique that makes it easier to read and interpret spreadsheets from a quick glance. It's often used to help make sense of large sheets of data that would otherwise be unintelligible — or take a long time to digest. 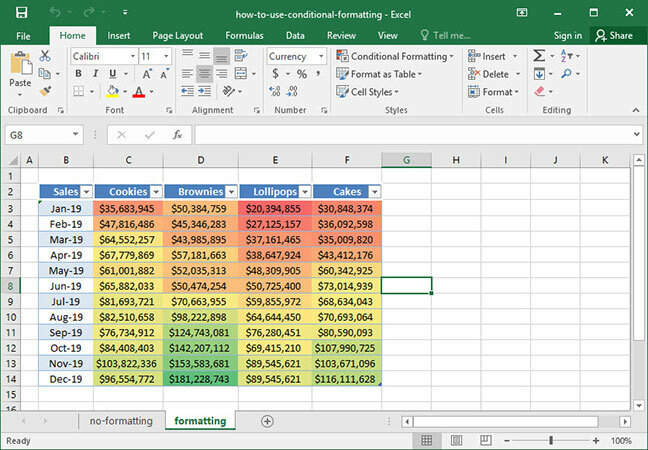 Below, we've screenshotted a typical use of conditional formatting in action. The below sheet shows SnackWorld sales by product category and month over the course of the year 2019. Notice that without any formatting or colors, the chart is fairly difficult to interpret without spending significant time looking at the numbers. But if we apply conditional formatting to our chart — in this case, we'll tell Excel to highlight cells based on a spectrum of color, where cells that contain lower values are highlighted in red and cells that contain higher values are highlighted in green — two takeaways immediately become clear: sales are improving month-over-month across all product categories; and Brownies is consistently the company's best-selling category, particularly towards the end of the year. 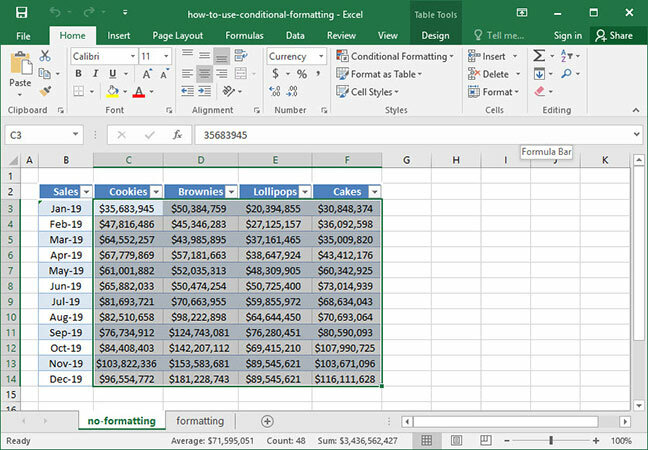 Read on to find out how to use this powerful tool to make your spreadsheets easy to interpret. The SnackWorld CEO has set a goal of $75,000,000 product sales within each category monthly. A SnackWorld analyst has been tasked with devising a simple way to visually determine whether the category sales goal has been met in any given month. To do this, she's decided to use conditional formatting to highlight all cells in which sales are above $75,000,000. 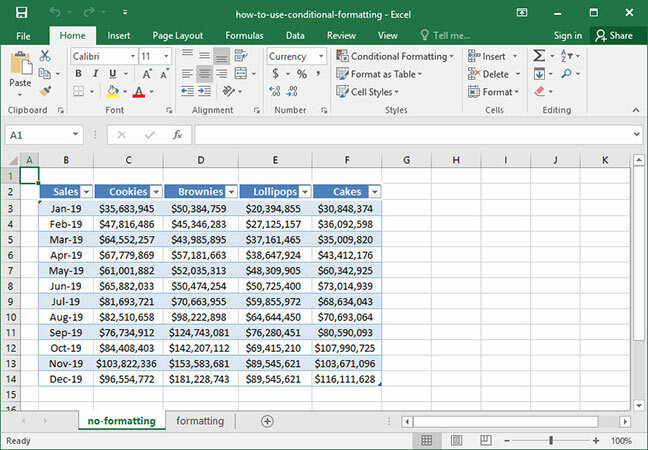 To get started on this task, we'll select the range of data that we want to conditionally format by clicking and dragging with our mouse. 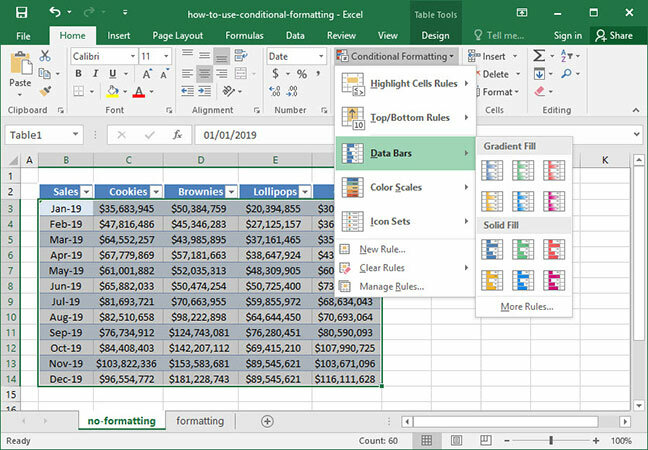 Note that we haven't selected the dates on the far left-hand side of the chart; if we do, Excel will recognize them as numbers and include them in the conditional formatting that we apply to the chart. We don't want to do that, since our dates are distinct from our data set. Press OK, and our formatting has been applied. Excel has highlighted all cells with over $75,000,000 sales in green! Now our chart is incredibly easy to read: it looks like SnackWorld started off the year slow, but started reaching its goals across categories around August or September. Greater than. Highlight cells that contain values greater than a set number. Less than. Highlight cell that contains values less than a set number. Between. Highlight cells with values that fall between two specified numbers. Equal to. Highlight cells with values that are equal to a specified number or string. Text that contains. Highlight cells that contain a specified string of text within them. A date occuring. Highlight cells containing dates that occur within a given time range. Duplicate values. Highlight cells that contain values that are duplicate (i.e., appear twice within the given table). Our analyst has successfully applied conditional formatting and presented her output to the CEO. Now, she wants to reset her data table back to normal. How can she do this? Note that we can also choose to clear rules from a given sheet, table, or Pivot Table. Top 10 items and bottom 10 items. Highlight the top/bottom # items by value (user-specified). Top 10% and bottom 10%. Highlight the top/bottom #% of items by value (user-specified). Above average and below average. Highlight values that are above/below the average for the data set. Cell highlighting is useful to show us quickly and easily whether certain points of data meet a given criteria. But it doesn't give us a particularly good view of our data set as a whole. Fortunately, Excel has two other useful tools that will allow us to visualize our sales numbers in more useful context. The first of these features is called Data Bars data bars overlay progress bars on our cells that represent value as a percentage of the maximum and minimum values in our data set. It's now much easier to see which months and product categories were the best and worst performers over time. The second useful feature we'll explore is called Color Scales like Data Bars, Color Scales allow us to visualize trends over categories and time — but our trends will be based on color variation rather than data bar size. Applying this formatting type will immediately modify the colors of our chart and give us some quick insight into sales trends: Brownies are our best-performing category, especially late in the year; but sales have increased within all categories month-over-month. 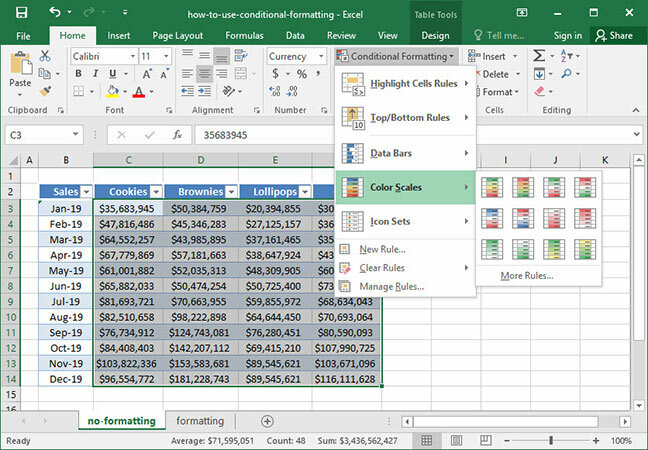 Those are the basics of using conditional formatting in Excel! Now you're well-equipped to quickly apply clarifying visual styles to your data that help make it easy to interpret. Questions or comments on this piece? Be sure to let us know below!